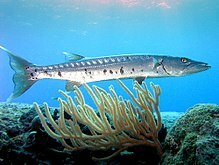 Espesye sa isda nga una nga gihulagway ni Edwards ni adtong 1771 ang Tabangko (Sphyraena barracuda). Ang Tabangko sakop sa kahenera nga Sphyraena sa kabanay nga Sphyraenidae. Pagka karon wala pay siak nga nalista ubos niini niya. ↑ 1.0 1.1 De Sylva, D.P. and F. Williams (1986) Sphyraenidae., p. 721-726. In M.M. Smith and P.C. Heemstra (eds.) Smiths' sea fishes. Springer-Verlag, Berlin. ↑ 2.0 2.1 De Sylva, D.P. (1990) Sphyraenidae., p. 860-864. In J.C. Quero, J.C. Hureau, C. Karrer, A. Post and L. Saldanha (eds.) Check-list of the fishes of the eastern tropical Atlantic (CLOFETA). JNICT, Lisbon; SEI, Paris; and UNESCO, Paris. Vol. 2. ↑ De Sylva, D.P. (1981) Sphyraenidae., In W. Fischer, G. Bianchi and W.B. Scott (eds.) FAO species identification sheets for fishery purposes. Eastern Central Atlantic (Fishing Areas 34, 47 (in part)), Volume 4. Department of Fisheries and Oceans Canada and FAO, Rome. ↑ Johannes, R.E. and J.W. MacFarlane (1991) Traditional fishing in the Torres Strait Islands., CSIRO Division of Fisheries, Tasmania, Australia. 268 p.
↑ 5.0 5.1 5.2 5.3 Daget, J. (1986) Sphyraenidae., p. 350-351. In J. Daget, J.-P. Gosse and D.F.E. Thys van den Audenaerde (eds.) Check-list of the freshwater fishes of Africa (CLOFFA). ISNB, Brussels; MRAC, Tervuren; and ORSTOM, Paris. Vol. 2. ↑ Feitoza, B.M., L.A. Rocha, O.J. Luiz-Júnior, S.R. Floeter and J.L. Gasparini (2003) Reef fishes of St. Paul's Rocks: new records and notes on biology and zoogeography., Aqua 7(2):61-82. Kining maong panid kataposang giusab niadtong 6 Disyembre 2017 sa 21:15.